Japanese Episode AG 169: "Moochul and the Three Rougela Sisters!!" American Episode 439: "Three Jynx and A Baby!" When this episode aired in Japan, 4Kids was still running the show. Kids' WB! was still airing Pokémon Advanced Battle, and the idea of Cartoon Network airing the show in Season 9 and beyond was laughable. The network hadn't gotten around to airing the Pacifidlog Contest episodes featuring Jynx yet, so we weren't even sure if Kids' WB! was even cool with the ebony-turned-violet pokemon. 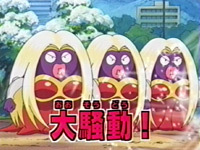 Since the episode features Rougela, onigiri, and cleavage, many fans believed that this episode wasn't going to be dubbed at all. 4Kids would skip it due and move on. Luckily, we live in an age where a slightly more competent company is handling the show, so we won't have to worry about perfectly harmless episodes like this one getting the ax anytime soon. It's not really that good an episode at all, but I'd rather see a lousy episode get translated into English than a good episode get left on the other side of the Pacific because someone decided that the episode is "too much" for kids to handle. I do have two comments about this episode. First of all, check out the scene where the Rocket-Dan fight over the onigiri. 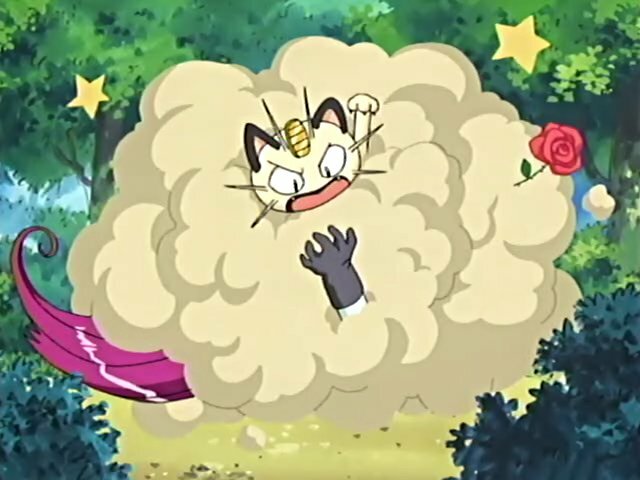 When the fight turns into the Hanna-Barbera-esque cloud of dust, you can see a rose coming out of it. I don't know about you, but personally, I think it's hilarious that Kojirou gets in a fight and thinks to take out his rose to help him fight off his fellow teammates. Another thing I noticed is that Rougela has the fastest evolution ever. It usually takes five to ten seconds for a pokemon to evolve on-screen, but in this episode, Moochul took less than two. The animation in this episode is kind of all over the place, from "not-that-bad" to "horribly off-model." Luckily, the Japanese version of the episode has some really good music to help make up for it...in fact, so did the Japanese version of "The Scuffle of Legends," now that I think about it. That makes me think that the anime producers notice when the animation isn't up to standard and so they make sure to use really good music to compensate. The dub, on the other hand, does not. PUSA only keeps three pieces of music (including the title screen music) and replaces all the Jirachi movie, Deoxys movie, and Jouto music with their own synthesizer crap. Ugh. James: "One look in those pretty Poké-peepers and I don't care if I ever eat." The final shot of the episode is three seconds longer in the dub than it is in the Japanese version.